from Tesoro del Mondo (Neri 1598–1600). The length and breadth of Antonio Neri's travels are far greater in thumbnail biographies and off hand remarks than can be substantiated by actual documentation. While stories of the glassmaker's travels through Europe abound, the truth of the matter is that only a small number of his movements have been verified through contemporary materials. But even if a minority of the wanderings attributed to Neri are true, then he certainly was a man of the world. Writing nearly two centuries after his death, historian Giovanni Targioni-Tozzetti claimed the priest left Italy to elude "thugs" in Florence who hounded him for the secret of transmutation. Tozzetti says he fled to England first and then visited Spain, Holland and France. No evidence has yet turned up to support any of this. Other accounts say he "traveled all over Europe" and that he deceitfully posed as a "common assistant" in order to learn scientific secrets that he could not gain access to by other means. One story I have heard making the rounds among glass workers is that Neri was chased to the "gates of Prague" by assassins. This is most likely confusion with a similar story about Venetian glassmakers leaving Murano without state permission to ply their craft elsewhere. There are four cities in which Neri is confirmed to have been present: Florence, the city of his birth; Pisa where he worked at the glass furnace run by Niccolò Sisti; Antwerp, where he spent about seven years visiting his friend Emmanuel Ximenes and in Mechelen, at the Hospital of Malines, where he wrote about pioneering medical treatments in a letter to a friend back in Florence. In addition, there are other locations that are strongly hinted at in various writings. 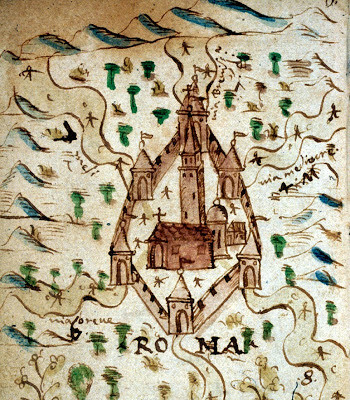 In his Treasure of the World manuscript, Neri has an allegorical depiction in the form of a simplistic map showing “The Ways to Rome.” It depicts the walled enclave of the Vatican (see illustration) with various paths representing different chemical routes to transmutation. If nothing else, this leaves the door open to a personal familiarity with the eternal city. In his glass book, L’Arte Vetraria, Neri mentions a number of specific locations in northern Italy, but perhaps none as authoritatively as Venice. He comments about the materials and techniques specific to the glassmakers on Murano. 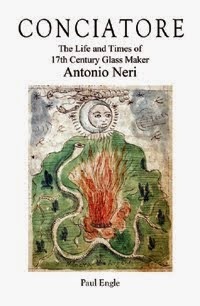 There is little doubt that Neri was exposed to Venetian glass workers in Florence, Pisa and Antwerp, so they provide a perfectly plausible source for his knowledge of their distinctive techniques. This would be a sufficient explanation, except that there is also a letter written by his friend Emmanuel Ximenes, detailing a route for Neri's visit to Antwerp; a route that runs through Venice. Below is the passage from a letter, dated 5 December 1602. The glassmaker would be delayed by illness, but the following year he did make the journey. While it seems a good bet that he followed Ximenes' instructions that is another detail in need of confirmation. “E fatto con prestezza fagotto, la mattina all'aprir della porta uscì el di Firenze e se n'andò in Inghilterra. Girò la Spagna, Olanda, Francia e Germania…” [He packed in haste and in the morning opened his door, left Florence, and went to England. He toured Spain, Holland, France and Germany…] Targioni-Tozzetti 189, p. 149. Ximenes 1601–11, 5 December 1602. * This post first appeared here on 19 Dec. 2014.